The Music Manual: Fascinations Grand Chorus, an education. Fascinations Grand Chorus, an education. COMPETITIVE in nature, body and music, New York duo, Fascinations Grand Chorus are a retro twanging, futurist singing creative pairing that calls upon a surf-rock anti-feeling sound. 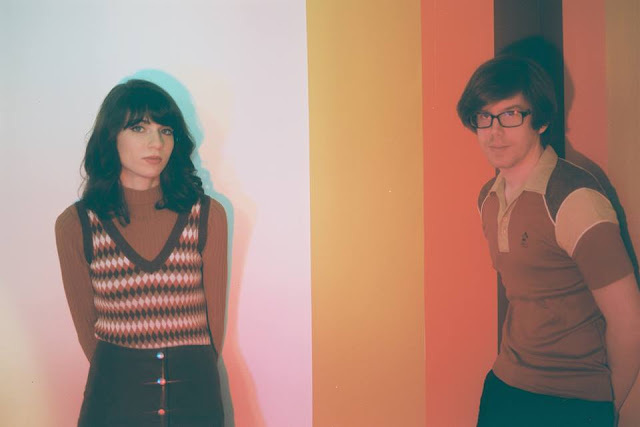 Psychedelia tainted tracks from the minds of Stephanie Culpo and Andrew Pierce have found them sitting high on a blissful partnership best summed up in their recent release of debut, self-titled EP. Speaking to Golden Mixtape earlier on this year about the pairing, Stephanie Culpo said: "I think it’s more about being on the same page musically. "It’s hard to find anyone of any gender who understands what I’m trying to do so when you find someone you’ve got to stick it out, even when you don’t get along. "There’s just a keen focus on solid songwriting and avoiding all the usual trappings that a lot of bands, who arguably do similar music, face - we’re more in-door boardwalk arcade types anyway." With three wholesome tracks on the EP, their brash ideologies completely override emotion in a cool and ditsy anarchist way. Culpo's enchanting sixties vocalism swoons around hefty instrumentals in tracks such as Growing, wrapping up enthralling harmonies and electronic impulses in a totally frank and innovative way. For more information and to get your copy of the EP, click here.